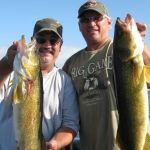 Located in the heart of some of the best fishing in the Midwest-Green Bay, Wisconsin. I wanted to take this time to tell you that I pride myself as a charter captain to make each and every trip a safe, learning and enjoyable fishing experience for every person I take out on the water. 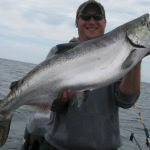 I truly believe the Bay of Green Bay, its tributaries and Lake Michigan offer some of the best fishing around. I would like to share this world-class fishing with you. 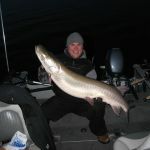 You could have a trip of a lifetime reeling in monster walleyes, screaming salmon, trout or a world-record muskie. Book your trip today and before it's over, you might even have a FISHIN ADDICTION. 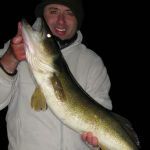 Your captain, Josh Berken, was born and raised in Green Bay, Wisconsin, calling Lake Michigan and the Bay of Green Bay, his home waters for more than twenty years, chasing multiple species such as; walleyes, muskies, salmon, trout, and northern pike. Along with being a certified Charter Captain and guide, Josh is also a devoted family man. He loves to spend time with his daughter and girlfriend, taking time to share this beautiful fishery with them, as well. Captain Josh's love for the sport of fishing began on the lakes in the Vilas County area at the age of five years old, when he used to visit his grandparents. The first thing he always wanted to do was get in the boat and start fishing. From there, his love for the sport grew. His father showed him the ropes on Green Bay and Lake Michigan chasing giant, yellow perch, walleyes, trout and salmon. Now his love for the sport is an ADDICTION! Captain Josh is now determined as ever to catch more and more fish. 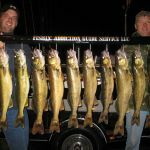 Pre fishing and fishing tournaments throughout the years has brought him never-ending knowledge on how to catch fish, especially in tough fishing conditions. Captain Josh spends endless hours on the water making it easy to stay on the fish. 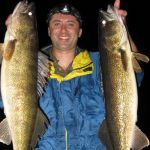 Whether you're a pro-fisherman or just a weekend warrior, Captain Josh is, eager to pass on his knowledge, as well as his love for the sport, and make your trip as enjoyable as possible. When your trip is all said and done, you just might have a fishing addiction! A positive attitude to try new things to catch fish. Captain Josh operates out of fully-rigged 2011 Lund Tyee Powered by a 150 Mercury Verado, along with a 9.9 pro kicker motor, and a Minnkota Terrova bow mount trolling motor with auto pilot to present the exact presentations to catch big fish. This boat doesn't only catch fish, but most importantly gives you a reliable, safe boat to fish out of. For your safety, comfort and fish limits, we prefer 2-3 person charters; however, larger groups can be accommodated if needed.